Two days until Thanksgiving! I know you’re probably buried in turkey brine and pie recipes, so I wanted to put something a little different up – something to help you use up your leftovers. Mashed potatoes are something we always seem to have a ton of and this is a great way to use some of them up. 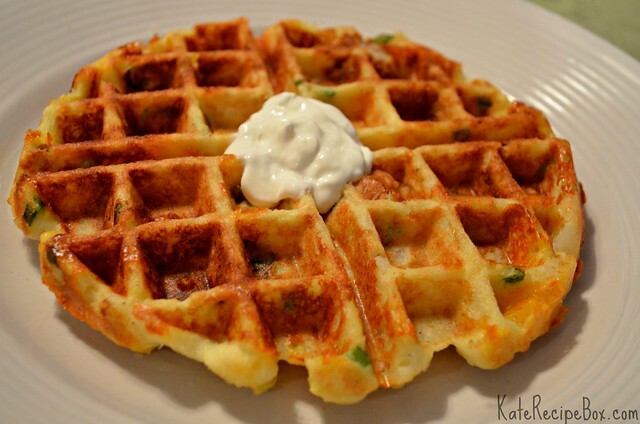 These waffles are super simple but are different enough that you don’t feel like you’re eating leftover again. In a large bowl, whisk together the oil, buttermilk and eggs until well combined. Mix in mashed potatoes until well combined. Stir in the scallions and cheese. In a separate bowl, whisk together the flour, baking powder and baking soda. Add the dry ingredients to the potato mixture and stir until just combined. Spoon 2/3 cup of the mixture evenly into a preheated waffle iron sprayed with non-stick spray. Cook until golden brown. Serve topped with sour cream.